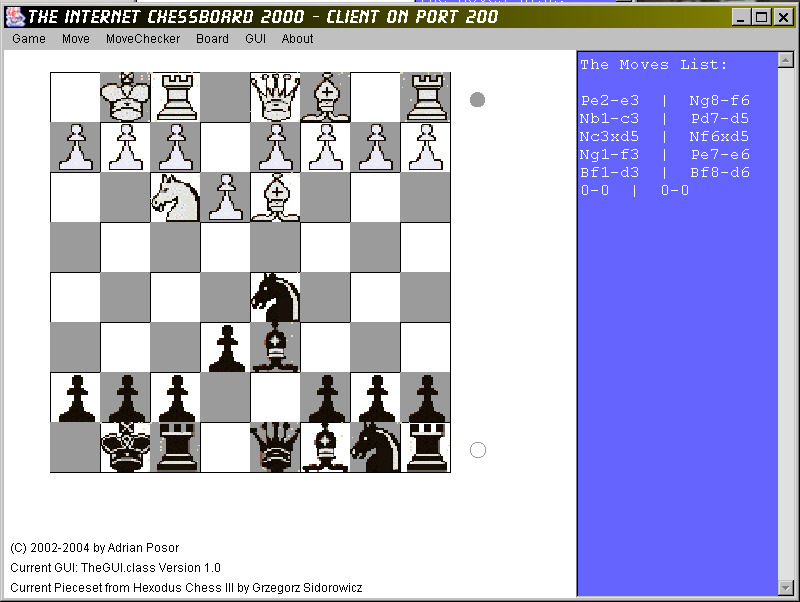 The Internet ChessBaord 2000, TICB2K for short, is a program to play chess over TCP/IP based networks. Multiple Clients can connect to a single server so other people have the possibility to watch the game. The program has a console which can also be used for chatting with the people connected to the server. The console is the main window and multiple servers and clients can be started from there. As a matter of fact, you can use this program without the GUI kindly provided. Enter 'help' or 'h' to get a list of all available commands. It is now possible to load and save games. It is possible to take back moves and to redo the take back. Celebrating MS-DOS: Who needs a GUI? Type 'sts 2000' to start a server listening on port 2000 for incoming connection requests. A window with a chess board will show up. Type 'stc localhost 2000' on the same promt to start a client connecting to localhost port 2000. Make a move in one window and it will be transfered over the network to the other window. Move forwarding to other clients is currently broken. Therefore, in case multiple clients are connected to a server, the clients do not stay syncronous with the server under all circumstances. The Move Checker; is currently not complete and may throw an exception when activated. Because of this the Move Checker is currently disabled by default.